The night of August 24, 1972, a young singer/songwriter by the name of Neil Diamond took over Los Angeles’ beautiful Greek Theater for 10 sold out nights. The legend of Neil Diamond the performer was unquestionably born on that night. Diamond and his band were at the peak of their game that summer, a night that would be captured forever on the two-record set Hot August Night changed his life and his legacy. One of Diamond’s most successful albums worldwide, the multiple platinum album in the US spent a mind-blowing 29 weeks on the top of the charts in Australia. 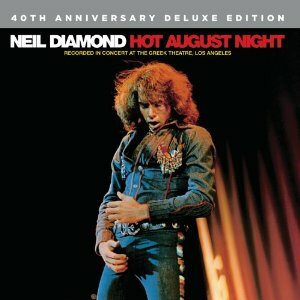 Hot August Night is one of his more celebrated and acknowledged albums of his career and arguably one of the greatest live albums ever recorded. Now, as impressive and wide-reaching as the scope Diamond showcases on the original recording, HOT AUGUST NIGHT 40TH ANNIVERSARY DELUXE EDITION will be released July 30, 2012 through Universal Music and covers an even greater array on this re-mastered edition, featuring signature hits and fan favourites as well as three previously unreleased recordings, plus all his stage banter and band introductions unearthed from the archives of 40 years ago, making this a complete aural experience capturing that magical night. “This album captures the very essence of Neil Diamond -- his vocals, his showmanship, his artistry and his rapport and command of an audience. His original album is a classic. We are honored that he has entrusted us to expand his masterpiece and deliver a deluxe edition that showcases that entire night’s show.” said Bruce Resnikoff, President/CEO, Universal Music Enterprises. The unreleased material includes “A Modern Day Version Of Love” where Diamond shows off all of his skills as a masterful vocalist with this gorgeous rendition of his 1968 chestnut. The Randy Newman-penned “I Think It’s Going To Rain Today “ is a genteel ballad in which Diamond displays his humanity, almost speaking the soft words against the backdrop of a sparse, but theatrical arrangement. And finally there’s “Gitchy Goomy,” which he introduces as a philosophy lesson to a child learning about life. And like all great children’s tales, this one has just the right mix of morality and infectious fun. Also included are the previously unheard band introductions, nearly ten minutes of a great showman putting on a class in the increasingly lost art of stage banter and showmanship. Across a musical career spanning nearly five decades, Neil Diamond has sold more than 125 million albums worldwide, has had 56 songs on Billboard’s Hot 100, including 37 top 10 singles and 16 top 10 albums. A Grammy Award-winning artist, Diamond has been inducted into the Rock and Roll Hall of Fame, Songwriter’s Hall of Fame and is a recipient of the Sammy Cahn Lifetime Achievement Award. Among Diamond’s many other honors, he has received a Golden Globe Award, 13 Grammy nominations and was named the 2009 MusiCares Person of the Year. Diamond is currently on tour, with a special stop scheduled in August at the Greek Theatre in Los Angeles, where it all began.